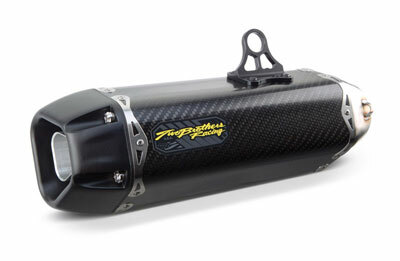 The all-new Tarmac exhaust is the latest state-of-the-art product from Two Brothers Racing. The new system features carbon fiber highlighted by a natural finished Aluminum outlet and stamped spring-mounted inlet for ultimate durability. The Tarmac exhaust from Two Brothers Racing showcases a brand-new design while increasing all-around performance. The beautiful new look is courtesy of TBR's innovative high temperature carbon fiber weave, while the performance is supported by TBR's constantly improving technology. The Tarmac exhaust from Two Brothers Racing is guaranteed to set both you and your bike miles ahead of the competition. The one-off, unique Trapezoidal shape provides increased ground clearance, while the available aerospace grade carbon fiber sleeves will max out your style and provide less weight than your previous system! the Tarmac muffler boasts a CNC-machined stainless inlet for exact fitment and a billet CNC outlet, included rivet bands with new larger 5/32 rivets adding strength and durability, while the use of rubber grommets at mounting points will reduce vibration. 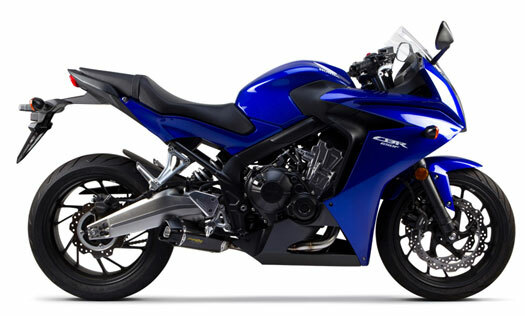 Blowing the doors off the competition is one-thing, but the sound reducing (removable) “T-Tip” standard on Tarmac mufflers ensures that it can be done while still enjoying the muscular, full-throated sound of your bike. The stainless steel deep draw stamped inlet with brushed finish along with the Two Brothers Racing spiral wound core will allow you to unleash your bike’s true potential as you carve the track.